FREE UNLIMITED STORAGE: Back up unlimited photos and videos for free, up to 16 megapixels and 1080p HD. Access from any device and photos.google.com—your photos are safe, secure, and private to you. FREE UP SPACE: Never worry about running out of space on your phone again. Photos that are safely backed up can be removed from your device’s storage in just a tap. 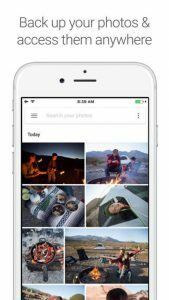 VISUAL SEARCH: Your photos are now searchable by the people, places and things in them—no tagging required. SMARTER SHARING: With smart sharing suggestions, giving your friends the photos you took of them is painless. And they can add their photos, too, so you’ll finally get the photos you’re actually in. SEND PHOTOS IN SECONDS: Don’t waste your data by texting and emailing photos. Instantly share up to 1,500 photos with anyone, right from the app. MOVIES AND GIFS, MADE FOR YOU: Get automatically created movies, collages, GIFs, panoramas, and more from your photos. Or easily create them yourself. MOTION STILLS: Advanced stabilization turns your Live Photos into beautiful looping videos or GIFs. ADVANCED EDITING: Transform photos with a tap. Use intuitive and powerful photo and video editing tools to apply content-aware filters, adjust lighting, and more. SMART AUTOMATIC ALBUMS: Tell better stories, without the work. Automatically get a new album with just your best shots after an event or trip, then invite others to add their photos. REDISCOVER: It’s easier than ever to relive your memories. Get collages of photos you took a year ago on this day – perfect for #tbt. ON YOUR TV: View your photos and videos on your TV with Chromecast and Airplay support. Using GPS in the background can decrease battery life. Google Photos doesn’t run GPS in the background unless you turn on optional features. Love how easy it is to back-up my photos straight from my iPhone. It also comes with the feature “on this day” which works like the “Facebook Memories” interface. A great way to remember past events we may have forgotten about.